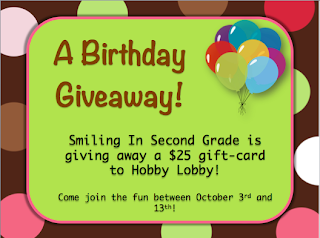 Smiling in Second Grade: Currently...It's My Birthday Month! So I totally missed last month's Currently. Back to School sure was busy this year! But I am back in business. It's my birthday month and I couldn't miss it! Love this book! It's so cute. Speaking of birthdays...go enter my Birthday Giveaway! 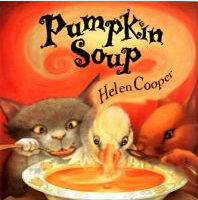 When I got to the bottom and read "Pumpkin Soup" for some reason I thought you were wanting to eat that and my reaction was "YUM" then I scrolled down! Silly me! Does sound good though- now I will have to check out that book!! Happy fall! Yay! Happy Birthday, birthday twin! I found out last night we share the Obama's anniversary too! Happy bday to you this month...Love that book too. 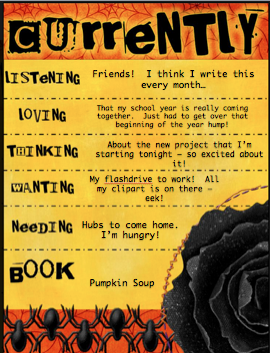 I can relate I feel like I'm over that hump too and things are slowly coming together as the year is kicking in...conferences are just around the corner too. Happy birthday! from a fellow Friends watcher. oh.em....gosh!!! clip art flash drive?!?!? I"m sending prayers your way!! lol!! Good luck with the flash drive! I have had dreams about loosing mine. I hope your flash drive is fixed soon. My external hard drive died last year, but luckily it was just all the files on my school computer, so I didn't really loose anything! Off to enter your birthday giveaway! I love Hobby Lobby!